Teething Puppy Or Land Shark? Teething is one of those stages that ALL puppies go through. Their gums swell as baby teeth get pushed out by bigger permanent teeth. Teething lasts from about 5-6 weeks of age when all the baby teeth have erupted until about 6-7 months when the permanent teeth take their place. Because puppies don’t speak HUMAN, and we don’t speak LAND SHARK, there is a natural disconnect between you and your new puppy. In addition to saving money on Band-Aids, your goal over the next few months should be to close that gap while building a loving, symbiotic relationship with your rapidly growing puppy. The following are 5 TIPS and 5 MUST HAVE PRODUCTS that will help preserve your sanity, and your fingers, during this trying, teething time. 1. Do NOT Punish Your Puppy For Biting! The word “punish” is used in a broad sense. Punishment here can include any form of hitting, slapping, yelling or otherwise punitive methods against a puppy for biting. I have heard trainers recommend holding the puppy’s mouth closed while yelling “NO” as a way to curb a teething puppy from biting. This is not only cruel, but it is actually reinforcing the very behavior the so-called trainer is trying to inhibit. In modern dog training, these aversive methods are considered a negative reinforcement. A negative reinforcement actually reinforces the behavior by adding a punishment (hitting, yelling) when the puppy bites and then taking the punishment away. Worst of all, puppies do not pair their biting with your punishment. They pair your punishment with YOU, or your kids, or your friendly neighbors. Puppies do not pair their biting with your punishment. They pair your punishment with YOU, or your kids, or your friendly neighbors. 2. DO Ignore the Behavior. Ignoring is considered a negative punishment. A negative punishment reduces behaviors (biting) by taking away or withholding something good (YOU). This really is a critical point that bears repeating. Remember, YOU are the one your puppy wants. YOU are the center of his new universe. This is why ignoring your teething puppy when he bites can be so powerful. It sends a non-verbal, non-physical message to the puppy that when he bites, YOU (his most favorite person in the whole world) leave or stop playing with him. 3. DO Reinforce Better, Incompatible Behaviors. This is my absolute favorite technique for all sorts of unwanted behaviors; barking, biting, begging at the table. That last one is particularly key when you have a dog who can rest his head on your table while slobbering over your steak. With this one, you do have to be a little careful. I have heard new puppy owners say “oh, when my puppy bites I just hand him a toy and tell him to chew that instead.” While this is close, unfortunately, handing the puppy a toy just after biting is reinforcing the unwanted behavior of biting by rewarding it. With a teething puppy that is biting, try something like this: puppy bites, you withhold attention (stand up, walk away, turn around so the puppy is at your back). After a full five to ten seconds, hand your puppy a safe chew or toy, and then praise the puppy for chewing his things. 4. DO Prepare BEFORE You Bring Your Puppy Home. I am always perplexed when new puppy owners act surprised that their teething puppy is biting. All puppies bite. Some more than others. But they all do it. As I stated earlier, it is a phase that all puppies go through. It is best to have a plan BEFORE you bring your new puppy home on how you are going to handle this phase. Ensure that your entire family, kids included, are in agreement with exactly how you want to train your puppy during this stage. This consistency will be key to ensure the puppy doesn’t get mixed messages causing confusion. Here are a few of my absolute favorite books for new puppy owners. I highly recommend you get, at the very least, The Puppy Primer BEFORE you bring your new puppy home. From teething and potty-training to beginner obedience and fun games for puppies, The Puppy Primer should be in every big dog owner’s library. 5. DO Have Patience With Your Teething Puppy. Remember your puppy is just a baby. If you have ever watched two puppies or two grown dogs play, they bite. I compare my two mastiffs to walruses; mouths open, biting necks, head butting, and all out body blows are common place and just a part of the way dogs play. When puppies are young, they need to learn that you are not another puppy. That association takes time. What often delays the timing of that correct association is the fact that the puppy is teething. During the teething stage puppies are rewarded every time they bite, whether it’s your pants leg or his toy, because it soothes their gums. The way you can combat against this inadvertent, yet constant, reinforcer is to make sure you have plenty of appropriate items on hand to redirect your puppy to. Here are my top 5 recommendations for appropriate large breed puppy chews, toys and products to help you through this trying, teething time. It is important that you ensure both the size and quality of the product will stand up to the more aggressive chewing of a large or giant breed puppy. For giant breed puppies (Great Danes, Mastiffs, Newfoundlands, Irish Wolfhounds) I would go straight to the XL Black Kong. For large breed puppies (Labrador retrievers, German shepherds, Pointers), you could get away with starting your puppy out with a smaller one. Consider buying two so that you always have one filled in the freezer ready to go. In addition to providing wonderful mental stimulation, a frozen Kong serves to not only provide relief to your teething puppy’s aching gums, but it also prolongs how long the puppy is occupied while licking it out. My go to Kong- filler is peanut butter, but you can fill them with just about anything that is safe for dogs to eat; yogurt, bananas, apples, carrots, pumpkin, cheerios, biscuits. Get out your Vitamix and go to town! I prefer Buck Bone Organic brand, but there are others. I still have the antlers I bought when Sulley was a baby, almost three years ago. They can be pricey to purchase, but they last forever and are totally worth the money!  NATURE'S GIFT FOR YOUR DOG - HAND CRAFTED Antler made into a perfect, eco-friendly, premium antler chew. Our Elk antlers are specially selected from grade A premium Wild Elk antler for a combination of weight, density and color. Each year wild Elk shed their antlers naturally, providing a perfect Eco- friendly, super-food dog chew. We then hand sort, inspect, cut and sand each individual piece to be placed in our resealable pouches.  OUR LARGE JUMBO CHEWS are good for dogs up to 120 lbs, they are 7-10" in length and delicious chew. Elk antler is full of protein, calcium, magnesium and other important minerals and vitamins that your pup needs. Honestly, I could feed a small village in Africa on how much money I have spent on stuffed animal toys for my dogs over the years. Read 22 Reasons Why My Big Dogs Are Proud To Live In America where I lament this topic further. Suffice it to say, heed my warning and save your money. Stuffed animal toys, while adorable, are generally not a great choice for a teething puppy. Unless, of course, your objective is to see how far you can expand your squeaker graveyard. And for a more extensive list of big dog appropriate toys, read Top 10 Best Toys for Big Dogs: Battle-Tested and Big Dog Approved. Bully sticks can be found many places, though I usually buy the ones at Costco. One word of caution is that I do not let my dogs consume bully sticks. I am vigilant when my dogs chew them and I take them away before they pose a choking hazard. If you have been to any dog show, you have seen these play yards, also referred to as exercise pens. Junior was my first puppy raised in one and I honestly don’t know how I survived puppy hood with my other dogs without it. I set up my play yard in the center of our main living area between our kitchen and family room so that Junior would always be right in the center of all of the action in the house. Because his crate is the size of a studio apartment, moving it around the house was just not feasible. The play yard enabled me to confine Junior without having to move his crate out of my bedroom. In A Bomb Proof Big Dog Starts With A Socialized Puppy I list 30 examples of socialization activities that you can and should do with your new puppy during the critical window between 8-16 weeks. The play yard facilitated numerous exposures that would not have been possible had Junior been confined in his crate in the bedroom. With as great as these are, please keep in mind that your puppy should NEVER be left unattended in a play yard. This includes when you leave the house for work or other reasons or at bedtime. Your puppy should be crated anytime you are not home or not awake and able to watch him. So, now it is your turn. What tips or advice would you add to this list? What are some of the products that have helped you survive a teething puppy (a.k.a. the dreaded sharp-tooth land shark) in your home? I would love to hear from you! Leave me a comment below. Hi Tamera – Thank you for your comment. Here is what I mean by “incompatible.” I mean that whatever you are trying to divert the puppy’s attention to, that behavior/toy is “incompatible” with his biting. In other words, the puppy can’t bite and do this too. Does that make sense? I am not a trainer, but this made sense to me when I wrote it. Let me know if this explanation helps. There is some common sense advice here that is often easy to forget, especially if you haven’t had a puppy for a while. I can’t imagine anyone losing patience with a puppy while it’s teething but I bet they do! Thank you so much, Dash. Unfortunately, I think there are many people who lose their patience with puppies. Oh yes, the puppy teething stage! “Land shark” love it Lol! I agree that by ignoring your puppy/dog that is actually the worst for them! They want to be with you, you are the centre of their universe and not to have your attention is the worst for them. I think offering up items for them to chew and sooth their gums during this stage is so important. I never had a dog with biting/teething issues however I did have a cat with biting issues once. You give great tips and alternatives to help. I can see these would be very helpful for pet parents. Wow! A cat with biting issues does not sound fun at all. Those are some very sharp teeth. I have been fairly lucky, too, Kamira. My puppies have been more destructive than biters during this stage. But either way, having chews and toys on hand is critical for all puppies; biters or not. That’s awesome, Luna! I’m so happy for you and your new little puppy and the positive approach you have taken with your dogs’ training! I also love the visual of “ninja moves!” Too funny! This is such a useful post for any puppy owner. Puppies will chew anything & everything. I like how you paired tips on chewing with products that offer productive and appropriate chewing alternatives. Perfect. Thank you so much, Cathy! I truly hope this brings hope and answers to all those flustered new puppy owners who are in the thick of teething right now. These are such great tips! I love how you dove deeper into positive reinforcement. You’re right, some people don’t do it well, even when they have the best of intentions. Great advice for new puppy owners. I’d forgotten how much kittens chewed and bit when I brought Truffle home. I though I’d kitten-proofed the house, but it was amazing the places she could get into. I even had to put my power cords for the computers into a trashcan to keep her from chewing. Luckily, the girls weren’t biters. Haha! Yes, too funny! Little ones are everywhere and into everything it seems. They certainly keep us on our toes. Ignoring and distracting – those were the two that worked for us with our two dogs. Puppies are cute and you might just think it’s cute when they bite (until it hurts and then you might punnish the puppy for it) but they have to learn better behavior. Great article on how to tackle this. Thank you so much, Bettina! I couldn’t agree more! That cute little puppy won’t be so cute when he’s grown and still biting. Thank you for the helpful information. I have been considering getting a puppy and hadn’t thought of making a designated play area in the house. The antler seems like a great chewing diversion. Really appreciate that you had other product information too. It is nice to know what has worked for others. Thank you, Theresa! I never had a play yard for any of my other puppies, but it sure did make life easier with Junior. Good luck with your new puppy! I would love to see pictures if/when you get him/her! Great advice here! Teething was bad for my Granddog Link – I wish I had your tips before he was through it. We did the frozen treat idea though and it helped A LOT! 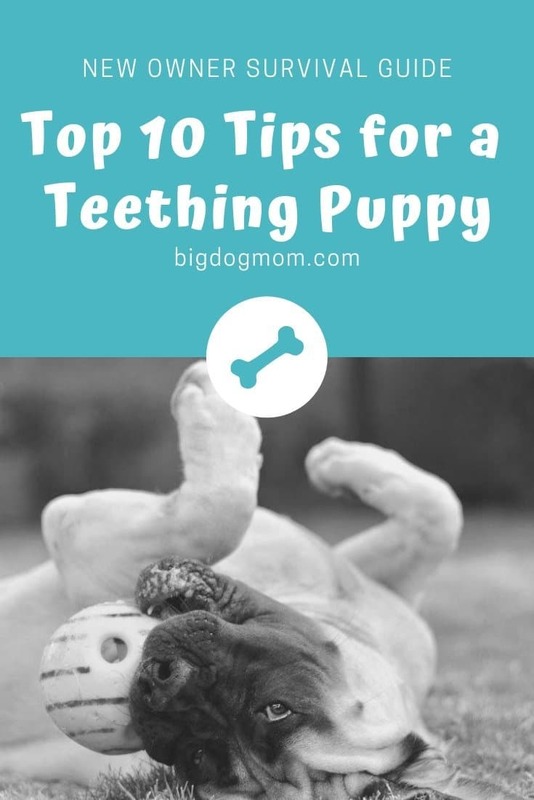 Next time we have a puppy I will use more of these great helpful ideas for teething pups! Awww, thank you so much, Joely! Yes, I still do the frozen Kong when I leave as a special treat. They love it!! What saved my skin (literally) when Jasmine was teething, was wearing a piece of rope around my waist. That way I always had something on me to offer her something appropriate to chew on. Oh, I love that idea, Jana!! Great post! I have two big dogs, one of which is a mastiff mix so I definitely have experience with positive training. My boys were rescued as puppies and with small children around, training puppies to teeth on appropriate items was a priority. Great suggestions. Thank you so much, Heather! I couldn’t agree more. I have two small kids too and I am training them as much as I am training the dogs most days. I’ve never had a puppy, so I never had to go through the teething stage. This sounds like great advice for puppy parents to follow. Thank you, Ashley! I agree. I have one in my freezer now and Junior is 9 months old. Every time the freezer opens Junior and Sulley come running. Ah, the biting stage, I remember it well! We raised three Husky puppies (littermates) and that was a fun, crazy, wild experience! Plus, I had a two already at home ( a one and two-year-old)! Lots of exciting days and three times the puppy teething! They are now 9, but reading this reminded me of those days of sharp shark teeth! Thankfully, it was not for long. You share great tips here (Pinning to my Bark About board to share)! A frozen Kong (well, 3) with natural creamy peanut butter was our go-to item along with chew toys. Oh, boy, I can only imagine how full your hands were when your huskies were young! You are right, the blessing is that this stage does not last forever. But it is a great opportunity for positive training and relationship building with a new puppy. Great advice on such an important topic! Teething is painful for both the dog and owner. LOL. Kongs are great! Great tips. It’s been a while since I’ve had a teething puppy. I always yell “ouch” when a puppy bites me so they learn mouth control, like what their mothers taught them. It did seem to work. Having lots of toys around is critical. Thank you, Sandy! I have tried the yelping before, but I have found puppies care about my pain to varying degrees. Ignoring and redirecting have been more effective for me, especially for puppies like Junior who just aren’t overly concerned that momma’s hurt. Haha! We had a play yard for our babes AND our puppies! ? 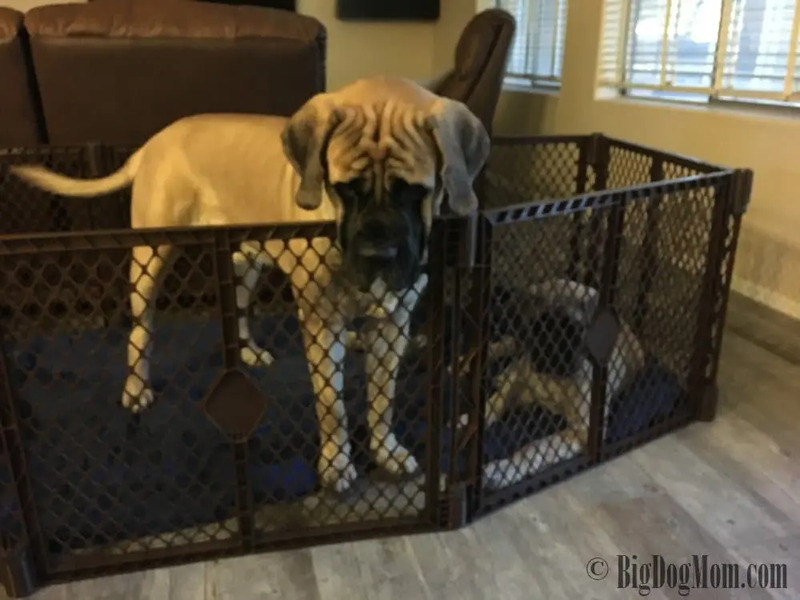 Your Mastiff puppies in this post ate AFORABLE! I love the wrinkles ? I love the idea of having a pen in the middle of the living area so the puppy can still see everything going on and feel like a part of the family. It really is wonderful! In fact we are puppy sitting a 4 month old Rhodesian Ridgeback puppy for the weekend and I set the play yard up to separate him during meal time. Make my life so much easier. These are excellent tips and ideas! I completely agree with #5 in both sections. Whenever you are training your dog, it’s so important to pair that training with exercise, socialization and patience. This is great advice. Puppies are cute, but their teeth (even tiny dogs) are so sharp! I loved raising puppies, but the last time we added a dog to the family, we chose to adopt a 4-year-old dog. It was fantastic to not go through the teething phase. He only chews his toys and can tell the difference between a plush toy for him, and one of the kids. Thank you, Lora! I’m so happy for you and your sweet 4 year old. Yes, you would hope they would be through the biting stage by that time. Amazing article with great advice. I know this is really about teething … but I’ve incorporated several of these ideas on a hunch. Bear Cat is a biter – and he bites HARD. I don’t think he ever learned the difference between a “I’m biting your hand off” bite and a play or love bite. When I ignore the bite, he first gets mad and really bites down … but if I don’t react, he’ll usually let go. As much as he took to chasing the flashlight and laser pointer in the beginning – he really likes to sink his teeth and claws into his toys when he plays. Just by switching to toys he can bite and claw, he’s needed to bite me less. Another thing I’ve learned?!? When Bear’s bored, he’ll act out all over the place – including biting. Thank you for linking up to the Showcase! Thank you so much! Wow, Bear Cat is definitely trying to tell you something I think. Giving him toys or the laser to distract or divert his attention make sense to me as a way to stop his biting. I will say, I think you might have it worse though – cats have very sharp teeth!! Great article. I have several friends who have “big dog” puppies and they never knew about the teething issues. They loved this post. As the purrrsonal assistant of five felines, my knowledge of canines sometimes is lacking and I love reading posts like this so I can learn something new. Great tips! I never thought too much about the timing of redirecting them to a toy, so that is really great advice. I also like the play yard idea, which we never used before. We also had big crates that were hard to move around, so that is really a perfect alternative. Thank you, Jan! Yes, the timing definitely matters when it comes to the message we are sending our dog. There is a fine line between being a reward for biting and an alternative to it. Heck there is so much to think about for a puppy, I never realised. I Like the positive reinforcement rather than shouting. Shouting which never works with me so why do people expect it to work for a puppy? I would add to your post, (because some people really do need it spelled out), that leaving your dog with an antler or bully stick could be a very bad thing. Delilah would chew that antler to the point that she could swallow it, so those definitely have to be supervised and limited. Both my dogs still love their Kong, so that is their nightly treat. (They like it stuffed with pineapple and frosted with applesauce or pumpkin). Thanks for adding this great post to the linky party! Thank you, Jodi! I didn’t even think about that! I will edit that post to ensure that caution is in there. I never leave my dogs unattended with any bone, antler or otherwise. Such a great point, thank you! Great info. I have adopted adults for my 2 present dogs, but she me of these tips would be good for adults or foster puppies. I also use to wet a wash cloth, squeeze it out a bit so it wasn’t dripping, tie it in a knot and freeze it. Tucker loved gnawing on it and I like to believe it gave him some relief. I bet that did help, Kara. My only concern with using a rag is the possibility of the dog swallowing pieces of it as it thaws. My guess is you supervised Tucker so it didn’t get to that point. Thank you so much for the feature! Puppy teeth do hurt, which is why most puppy owners are literally crying out for some tips on how to get through such a trying puppy stage. I am so happy this post was helpful!